Organizations that rely on data from systems certified through NCQA’s eMeasure Certification program can be confident that systems have gone through the industry’s most rigorous assessment of whether they provide accurate data. The NCQA eMeasure Certification program evaluates how well electronic systems calculate electronic clinical quality measures (eCQM) using electronic clinical data. Health plans, provider organizations and others rely on accurate data to make decisions about value-based contracting. By earning eMeasure Certification from NCQA, organizations can say their system has undergone the industry’s most rigorous assessment. Reporting is more accurate for these systems than systems not certified by NCQA. NCQA’s eCQM test methodology is the only approved ONC test tool alternative to the Project Cypress system. Learn more on NCQA’s ONC Health IT Testing web page. Qualified clinical data registries (QCDR). Become a trusted vendor. 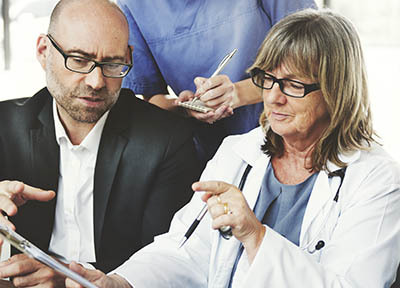 NCQA’s HEDIS® and the Centers for Medicare & Medicaid Services (CMS) Medicare Stars reporting programs can use certified eCQM data for performance measurement. Certified data in the approved QRDA format can be used as supplemental data and added to other records to calculate HEDIS measures at the health plan level. Demonstrate accuracy to your customers. NCQA eMeasure Certification helps ensure data integrity—vital in value-based contract arrangements. Help your customers become more efficient. Reduces the burden on health plans while improving data. In the future, practices seeking NCQA PCMH recognition will have the option to submit electronic clinical quality measures (eCQMs) to NCQA in support of their recognition process. The list of measures from which to choose can be found in the Quality Measures Crosswalk. NCQA creates unique sets of sample data, or “test decks,” for each eCQM, developed from randomly generated synthetic patient-level test data. You process a test deck using your measure code. NCQA compares measure results to expected results, to determine if your software’s code computes the measure correctly. Multiple test decks are available for each measure, so you can correct errors. A measure is NCQA-Certified when it passes certification. You receive a final certification report and seal to distribute to health plans, potential clients and Certified Auditors to demonstrate your achievement. Interested in becoming an NCQA-Certified vendor? The first step is completing an application and signing a one-year certification agreement. Request an application through My NCQA. Select “eMeasure Certification” as the product/program type.